If you are looking for a high performance, breathable membrane for your supported or unsupported tiled, slated or metal roof system, look no further than Cromar Vent 3 Pro. This carefully constructed fabric provides you with all the protection you need to ensure that your building remains watertight and damp free. Apply it unsupported over rafters or lay it directly over your insulation. The successfulness of the product comes down to its three layer structure, which has been carefully constructed using the highest quality materials. In fact, the product is completely certified by the BBA, which is your assurance that you are investing in a material that has been heavily tested and approved to use by specifiers, local authorities, building control and insurers. The function of the outer layer is to provide a highly waterproof surface, ensuring that your building remains protected against any adverse weather. In addition to being impervious to any form of precipitation, Cromar Vent 3 High Performance Breathable Felt is highly resistant to the uplift force created by wind. It reduces the noise created by wind as it blows through the tiles and it limits the risk of tiles or slates lifting off in windy weather. The middle layer has been designed to provide the felt with a breathable waterproof membrane, which allows any moisture vapour to pass through. Because water vapour can escape, it doesn’t re-enter your building, which if trapped, could cause issues relating to damp and pour ventilation. 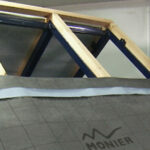 The function of the inner layer is to protect the breathable membrane. In addition to preventing abrasion and other possible forms of damage, it gives the entire structure of the Cromar Vent 3 Pro extra strength and durability. Despite the three layers, the Cromar Vent 3 Pro remains highly breathable, and allows moisture vapour to pass through, even though it is very water tight. This is largely down to the material, which is high tensile spun bonded polypropylene layers around a micro porous polypropylene film. In addition to its waterproof nature, the polypropylene is incredibly strong, with an excellent resistance to nail tears. It can also be applied in warm or cold weather. Because of its qualities, Cromar Vent 3 High Performance Breathable Felt is an essential for any professional company or person looking to carry out a roofing project.